SEO for Cryptocurrency is a huge market, one that you need to take advantage of right now!! There are two main players in the SEO for Cryptocurrency market: those who must be aware of the rapidly changing techniques to maintain a quality SEO, and those who need the prowess of a good SEO. SEO is an acronym for Search Engine Optimisation. What an SEO does is assist online businesses with getting seen on the internet and increasing traffic, and therefore customer base, to a specific retailers website. Using trusted algorithms and complicated mathematics, a good SEO can decipher exactly what keywords to use to get a retailers page highly ranked on search engine results. A great SEO has their finger on the pulse of any changes or swings in the marketplace as jargon and interest can change often and radically. This has become even more important recently with the public embrace of all things crypto. Cryptocurrencies are digital, decentralized, and largely anonymous, currencies. They can be purchased and traded online, and balances are stored within digital ‘wallets’. Transactions between parties are public within their respective networks, to ensure validity, and are coded and archived. The transactions are recorded by using a very specific type of technology called blockchain which, for cryptocurrencies, provides an immutable account of any transaction that has occurred. Completely removing the need for an intermediary party. Buh-bye Big Banks. Blockchain technology is proving to be exceptional in many other areas as well. The importance of good SEO for Cryptocurrencies cannot be overstressed. Cryptocurrencies have made their way into the market slowly over the past ten years, but in the last two, it has become a booming industry. Cryptocurrencies and crypto-related businesses have become a sensation that everyone wants a part of, and the clock is ticking for you to make your next move. With all of these new business opportunities and startups, standing out amongst the crowd becomes not only important but paramount to making your business profitable. So how do you make your business stand out above the rest? First, we have to understand how the consumer looks for crypto business. Like many digitally based businesses, the consumer “shops” for products or services online. It seems obvious, but take a minute to unpack what that means. Traditionally, if you had questions about services, or wanted to know how to use a product, you walked into the nearest retailer and talked to them about it, possibly trying out a few models to find the best fit for your needs. With the digital marketplace, consumer confidence is a bit lower, as they can’t generally discuss their specific needs or concerns with the retailer themselves. So most customers head to Google, or Bing, with their questions. The average consumer will then blast through the first few articles that come up on the search results list, mentally collating that information. This establishes authority and trust in whichever business or articles come upon those first few pages. Enter SEO for cryptocurrency. SEO for cryptocurrency ensures that your business, or an article/blog that directly references your business, is seen within those first few pages of results. This increases not only customer confidence in you as a retailer but also increases traffic to your website. Thus, increasing not only your customer base but your online presence and reliability as a retailer. If your business doesn’t have a noticeable online presence, you will never be able to capture new customers. Online presence, and being a part of the “online conversation”, has become a far more effective marketing tool than ad campaigns alone. The average consumer has grown accustomed to filtering out, or scrolling past, canned ads and banners. Advertisements have inundated customers in such a way that they have essentially become visual white noise. Choosing the wrong types of advertisements can also be detrimental to your business’ credibility. Customers want to see information tailored to their individual requests. This is where SEO for cryptocurrency becomes pivotal to increasing your profits. SEO not only captures customers who are in the market specifically for what a company is offering, but it also enables a company to become more visible to parties who are interested in affiliate services, or competitive products. The cryptocurrency market is expanding at an astonishing rate. In order to stay relevant amongst a sea of competitors, a business must employ SEO techniques throughout their tenancy. Retailers must endeavor to keep up with the ever changing digital market. This can prove difficult for retailers, especially if they rely on conventional advertising methods. Recently, some of the larger tech authorities, like Google, Microsoft, Facebook, and Twitter, have all banned traditional and conventional types of advertising for cryptocurrency businesses. SEO for cryptocurrency can, legally and legitimately, circumnavigate these changes, while keeping your business at the forefront of the online community and maintaining your credibility. 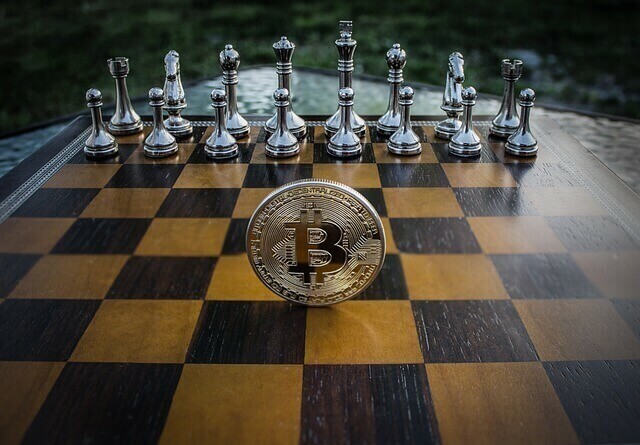 The game is underway and cryptocurrency SEO is the strategy to use to avoid your business succumbing to an online checkmate.